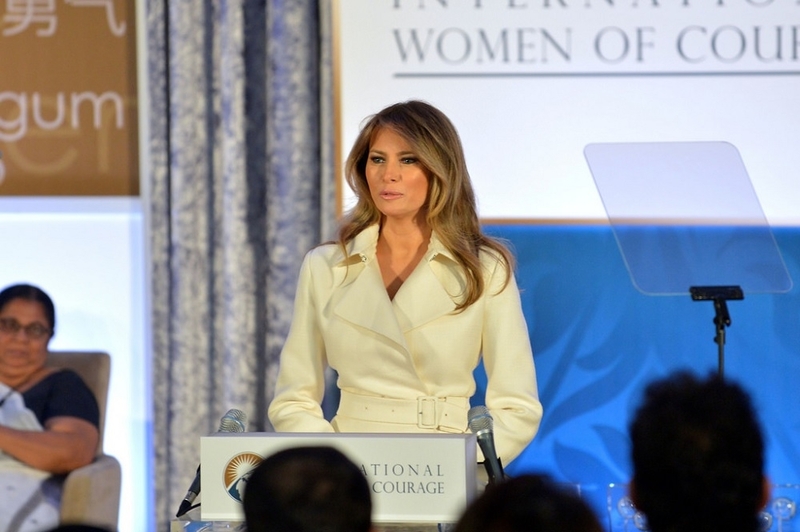 Melania Trump 2019: What Changed on the First Lady’s New Year’s Celebration? While United States President Donald Trump was tweeting his way through the holidays, first lady Melania Trump purportedly took care of the New Year’s celebrations. Meanwhile, reports also note what changed in the way FLOTUS welcomed 2019. CNN reported that Mrs. Trump spent time with son Barron Trump during the holidays before attending to some official engagements with the President on Christmas Eve. She then traveled back to Palm Beach to set up for their family's New Year’s celebration at Mar-a-Lago. The festivities hosted by Mrs. Trump was also reportedly attended by the President's older children including Donald Trump Jr. and Ivanka Trump. The same report noted that Mrs. Trump opted for a “more low-key” setup, which was implied to be out of fashion for the family. In an Instagram post by Brazilian model Amanda Ungaro Zampolli, the first lady was spotted wearing an all-black dress during the Mar-a-Lago party. Melania Trump’s choice of outfit during the New Year’s Eve festivities was also deemed to be a break from tradition. InStyle pointed out that she was known for wearing something pink during holiday celebrations in the previous years. White House reporter Kate Bennett also retweeted Mrs. Trump’s New Year’s Eve selfie. The photo was the first lady’s first selfie during the holidays since 2017, according to Bennett. FLOTUS simply captioned it with the hashtag #HappyNewYear2019 after apparently cropping Barron out of the picture. The year 2018 was quite a whirlwind for Mrs. Trump with the media remaining keen on her every move, statements, and fashion choices. A Zara jacket that had the printed text “I REALLY DON’T CARE. DO U?” was definitely one of her most talked-about piece of clothing in 2018. Melania Trump was photographed wearing the jacket while boarding a car before going to Texas to visit detention camps for immigrant children that had been separated from their parents upon reaching the U.S. border to seek asylum. Several reports later interpreted her fashion choice as a message to the media and her critics. Mrs. Trump confirmed in October that the jacket “was kind of a message” despite her spokesperson previously stating otherwise.